Josh McCown - Rated Rookie. Graded BCCG 10. 2002 Donruss. Card # 206. The card is serial numbered 140/800 and is in NM condition. 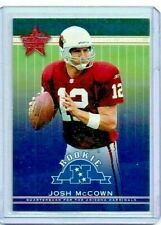 2002 Josh McCownJERSEY ROOKIE CARD. Upper Deck Honor Roll "Rookie Honor Roll Jerseys" (#RHR-JM). All single cards are placed in a top loader. All Card(s) are in NM-MT condition. Single Cards (up to 5 card lots). 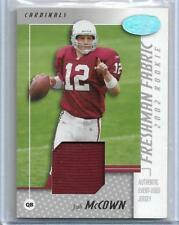 2002 Upper Deck Football Jersey Patch Card Of Josh McCown. This card is in NM/MT condition. 2002 Upper Deck Football Dual Jersey Patch Card of Joey Harrington & Josh McCown. This card is in NM/MT condition. The card contains an on-card autograph in blue ink and is card number 27 in the set. Condition is NM-MT or better. This card has a population of 1 as of 10/06/2017. Ask for Salty, Na Brown, Tad Applegate IV, Hester or Lex. 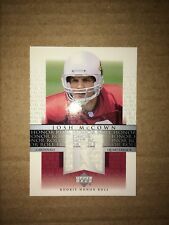 2002 Atomic Josh McCown Die-Cut Rookie !!!! #117!! (Cardinals)!! Player: Josh McCown. Item#: 269. Set: 2002 Fleer Maximum To The Max. Manufacturer: Fleer Inc. Year: 2002. Sport: Football. JOSH McCOWN. 2002 BOWMAN'S BEST BLUE. RC ROOKIE JERSEY RELIC. See scans for condition. NRMT or better in my opinion. JOSH McCOWN. RC ROOKIE JERSEY RELIC. 2002 UPPER DECK GRADED. See scans for condition. NRMT or better in my opinion.